As we’ve published and blogged about, women in California — especially low-income women — have been especially impacted by recent years’ state budget cuts and by the Great Recession and its aftermath. However, the right public investments and policies can play a critical role in helping women and girls thrive in school, career, and life. On January 16, the Women’s Policy Summit at the Sacramento Convention Center — hosted by the California Center for Research on Women & Families (CCRWF) — will take a close look at how public policies can improve the health and well-being of women and girls in California and will discuss what state legislators and leading advocates see as the top priorities for the coming year. The 2014 Women’s Policy Summit: Advancing Women’s Health, Wealth & Power will cover a wide range of topics, including: Women, Poverty & Economic Empowerment; Constructing a Vision for California’s Child Care and Early Education System; Women and Health Care Reform; Health Disparities & Gender; and many others. The summit also will feature a luncheon keynote address from social justice advocate and attorney Sandra Fluke on the future of reproductive rights in California. CCRWF is hosting the summit with support from The California Endowment. The event is co-sponsored by the Legislative Women’s Caucus and the California Commission on the Status of Women and Girls, as well as by the California Budget Project and other organizations. For questions or additional information, contact Summit Event Coordinator Cathy Murnighan at summit@ccrwf.org. Full registration information will be posted by November 11 on the CCRWF website. Next month, following a 15-year run, the curtain will go down on California’s Healthy Families Program (HFP), which has provided low-cost health, dental, and vision coverage for children in low- and moderate-income families. As part of the 2012-13 state budget deal, lawmakers adopted Governor Brown’s proposal to transfer children enrolled in the HFP to Medi-Cal, California’s largest publicly funded health coverage program for low-income residents. In addition to providing coverage for children transitioning from the HFP, Medi-Cal now covers all newly enrolling children who were previously eligible for Healthy Families, up to 250 percent of the federal poverty line ($48,825 for a family of three in 2013). 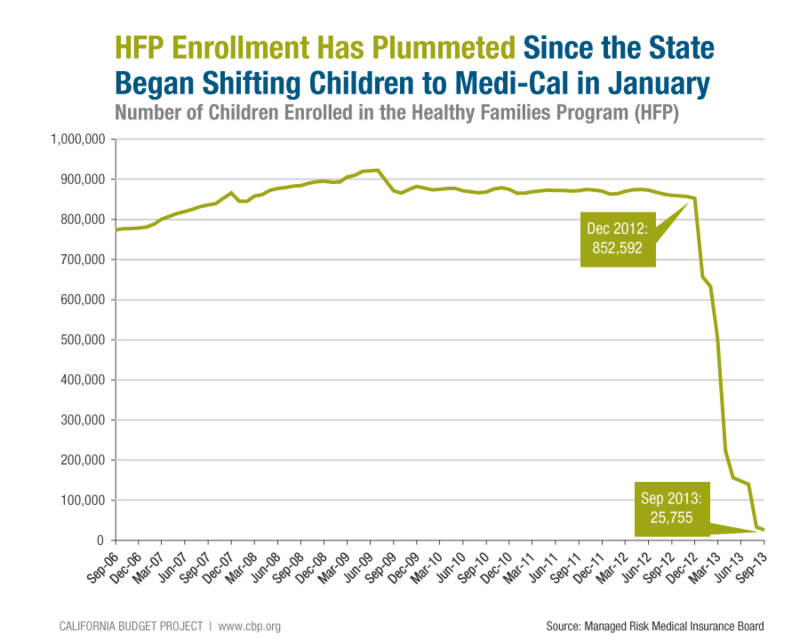 The shift of children from Healthy Families to Medi-Cal began this past January 1 — when about 850,000 kids were enrolled in the HFP — and has proceeded in several stages. By the end of September, nearly 730,000 children had been transferred to Medi-Cal, although tens of thousands of children did not make the transition because they lost eligibility for Healthy Families prior to their scheduled transfer date. (Children can be removed from the HFP for a number of reasons, including if their families do not pay monthly premiums or they reach their 19th birthday and “age out” of the program. It’s likely that at least some of these children found — or eventually will find — their way onto Medi-Cal by applying for coverage through their county human services offices.) The final group of children — more than 20,000 — will transfer from Healthy Families to Medi-Cal on November 1. Once the transition from Healthy Families is complete, nearly half of all California children will be enrolled in Medi-Cal, according to state estimates. Ultimately, the success of this transition will hinge on whether children in Medi-Cal are able to access the health care services they need. In this regard, state officials have more work to do. For example, many children with autism lost access to critical behavioral health services when they were shifted from Healthy Families to Medi-Cal. Another concern: Doctors, dentists, and other Medi-Cal providers are bracing for — or have already felt the impact of — a 10 percent provider payment cut that the state has begun implementing, although primary care doctors will be largely shielded from this reduction through 2014 due to a provision in the federal Affordable Care Act. It’s too early to tell whether these payment changes will, on balance, have a positive or negative impact — or no impact — on provider participation in Medi-Cal and thus on children’s access to care. State officials should closely monitor the situation in the months ahead to ensure that all of the more than 8 million Californians enrolled in Medi-Cal — children and adults alike — have timely and adequate access to needed care. This payment boost is welcome news for primary care physicians who participate in Medi-Cal, since they currently receive exceptionally low reimbursement rates relative to their peers in other states. California’s Medicaid payments for ACA primary care services were the third-lowest in the US in 2012, when measured as a percentage of Medicare payments for the same services (see chart). Once the ACA rate increase takes effect, California’s Medicaid payments for primary care services will more than double, rising by an average of 136 percent, according to the Kaiser Family Foundation. Based on state estimates, the ACA increase will bring an additional $1.2 billion in federal Medicaid funds to California during the 2013-14 fiscal year — dollars that will support the work of primary care physicians who serve very-low-income Californians through the Medi-Cal Program. Moreover, because primary care doctors are largely shielded from the payment cut that the state is currently rolling out, they will receive roughly $250 million that they otherwise would have lost during 2013-14, with half of these dollars coming from the federal government and the other half from the state. Taken as a whole, these additional dollars, although temporary, could help to boost primary care doctors’ participation in Medi-Cal as the state prepares to implement a major expansion of the program in January 2014. Still, it’s worth bearing in mind that the Medicaid payment increase is set to expire at the end of 2014. At that point, primary care doctors not only would lose the temporary rate bump provided by the ACA, but also would be fully subject to the rate cut that the state is currently phasing in. Such a steep drop in payments could cause at least some primary care physicians to rethink their participation in Medi-Cal in 2015. In order to head off that possibility — and provide greater fiscal certainty for other Medi-Cal providers — state policymakers should consider repealing the 10 percent cut for all providers as part of next year’s budget debate. Through Covered California, consumers for the first time will be able to make apples-to-apples comparisons of their health coverage options, a change that should help people make more informed choices. Moreover, while Californians will be able to purchase coverage outside of the exchange, Covered California is the only place where residents with incomes up to 400 percent of the federal poverty line — currently $45,960 for an individual — can use federal subsidies to lower the cost of the coverage that they buy. These new coverage options can’t come soon enough for many Californians. In 2012, more than one-fifth of residents lacked health care coverage in 10 of the 40 California counties for which data are available, according to the US Census Bureau. These 10 counties, which include Los Angeles, Riverside, and Fresno, are home to more than two in five Californians. It’s important to bear in mind that health care reform won’t reach all Californians. In particular, undocumented immigrants are prohibited from purchasing coverage through Covered California and will remain ineligible for Medi-Cal. 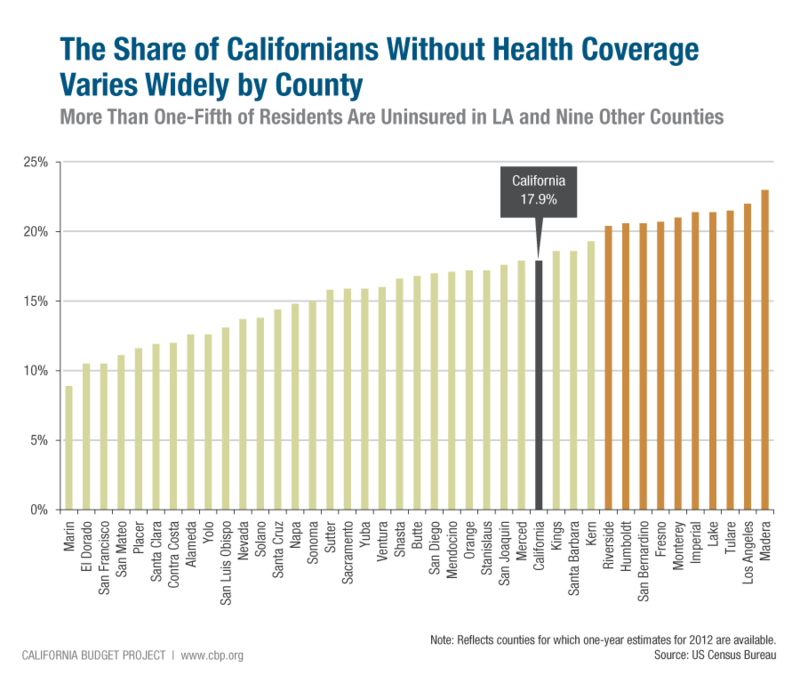 A recent report from the UCLA Center for Health Policy Research notes that “despite being in working families, most undocumented immigrants are not covered by health insurance and face significant access-to-care barriers.” This is a key reason why we’ve consistently highlighted the need to maintain a strong county health care safety net to assist Californians who fall through the cracks. Still, full implementation of health care reform this coming January will significantly improve the lives of millions of Californians — US citizens and legal immigrants alike — who currently lack access to affordable coverage and live daily with the prospect of being one medical diagnosis away from financial ruin. Two years ago, facing a substantial budget shortfall, state policymakers agreed to cut — by 10 percent — payments for doctors, dentists, and other providers who participate in Medi-Cal, California’s Medicaid program. Lawsuits filed by health care provider associations put this reduction on hold, but the state recently has won key federal court decisions. As a result, the Brown Administration began implementing the 10 percent cut earlier this month, starting with payments to dentists and medical transportation providers. Incredibly, this reduction will apply not only going forward, but also retroactively to June 1, 2011, which means that providers will have to gradually pay back part of the payments they’ve received over the past couple of years. The retroactive portion of the cut is not yet in place, and the state’s recent guidance does not indicate how it will be implemented. However, earlier this year, the Administration suggested that the state would retroactively recoup payments from providers by temporarily imposing an additional 5 percent cut, for a total reduction of 15 percent. This additional 5 percent cut would remain in effect until the full amount owed retroactively is repaid. Health provider associations have at least one more legal avenue: an appeal to the US Supreme Court. An appeal has been filed, although it will likely be months before the Court decides whether to take the case and, even if it does (a long shot), a ruling would not be handed down until 2014. In the meantime, the rate reduction will move ahead. State policymakers should revisit this issue as part of next year’s budget debate and decide whether a deep cut to the state’s main health care program for low-income families — a cut made during the dark days of a budget crisis — is really the best way forward for California. Repealing this reduction is a sensible step that would both create greater fiscal certainty for providers and represent a critical state investment in the success of health care reform. Yesterday, the CBP participated in a webinar looking at the pending expansion of the Medi-Cal Program — a cornerstone of federal health care reform — and what that change may mean for philanthropy and nonprofits. The webinar was sponsored by the California Association of Nonprofits and a consortium of California grantmakers called California Philanthropy. The webinar also featured Peter Long, president and chief executive officer of the Blue Shield of California Foundation, and Ellen Wu, executive director of the California Pan-Ethnic Health Network and a CBP board member. The CBP’s presentation reviewed key changes to Medi-Cal that will be implemented in 2014 as a result of recent state legislation. We also highlighted two issues that could hinder low-income Californians’ access to health care services in the years to come: a pending cut to Medi-Cal provider payments (approved in 2011 but not yet implemented) and a major shift of health care dollars from counties to the state, a change that was included in this year’s state budget agreement. 1/1/14 — the date that the Medi-Cal expansion is scheduled to begin. 1.4 million — the number of Californians estimated to be newly eligible for Medi-Cal in 2014 under the expansion. 635,000 — the number of newly eligible Californians expected to enroll in Medi-Cal during the first six months of 2014, according to recent state estimates. This figure includes 490,000 Californians who will transfer from the temporary Low Income Health Program (LIHP) on January 1, 2014. LIHP — which was created as a “bridge” to health care reform and expires at the end of 2013 — uses federal and county dollars to serve low-income adults who do not qualify for Medi-Cal under current rules. The vast majority of Californians enrolled in LIHP will be eligible for Medi-Cal in 2014, while the remainder will be eligible for coverage through Covered California, the state’s new health insurance exchange. The state’s estimate of the number of LIHP enrollees who will shift to Medi-Cal appears to be low. For example, in April 2013 LIHP enrolled about 575,000 Californians who will qualify for Medi-Cal under the expansion, or over 80,000 more people than the state estimates will move from LIHP to Medi-Cal. Moreover, LIHP enrollment could increase in the coming months to the extent that counties boost their outreach efforts. Therefore, the number of Californians who enroll in Medi-Cal under the expansion during the first half of 2014 could substantially exceed the state’s total estimate of 635,000. 100% — the share of Medi-Cal expansion costs covered by the federal government from 2014 through 2016. The federal share will gradually phase down to a still-high 90% by 2020. $1.5 billion — the amount of federal funding that California is expected to receive in 2013-14 to pay for the expansion. Federal funding is projected to increase substantially in later years. Using “moderate-cost assumptions,” the Legislative Analyst’s Office projects that California will receive $3.5 billion in federal funding for the expansion in 2014-15, rising to $6.2 billion by 2022-23. 3 to 4 million — the number of Californians estimated to lack health care coverage by 2019, even with full implementation of federal health care reform. This group is expected to include 1 million undocumented immigrants. $3.8 billion — the total amount of funding that is projected to be shifted from counties to the state over the next four years under the budget agreement ($0.3 billion in 2013-14, $0.9 billion in 2014-15, and $1.3 billion in each of 2015-16 and 2016-17). Counties use these dollars — which they receive as part of the 1991 state-to-county realignment of services — to provide health care to medically indigent residents. The budget deal assumes that counties will no longer need all of their 1991 realignment health care dollars as many medically indigent adults newly enroll in Medi-Cal under the expansion. The funds redirected to the state will be used to pay for CalWORKs grant costs that would otherwise be funded with General Fund dollars, and thus will generate substantial ongoing state savings. At this point, it’s not clear whether the amount of funding that remains with counties will be sufficient to provide health care for the millions of Californians who are projected to lack health coverage even after full implementation of health care reform.